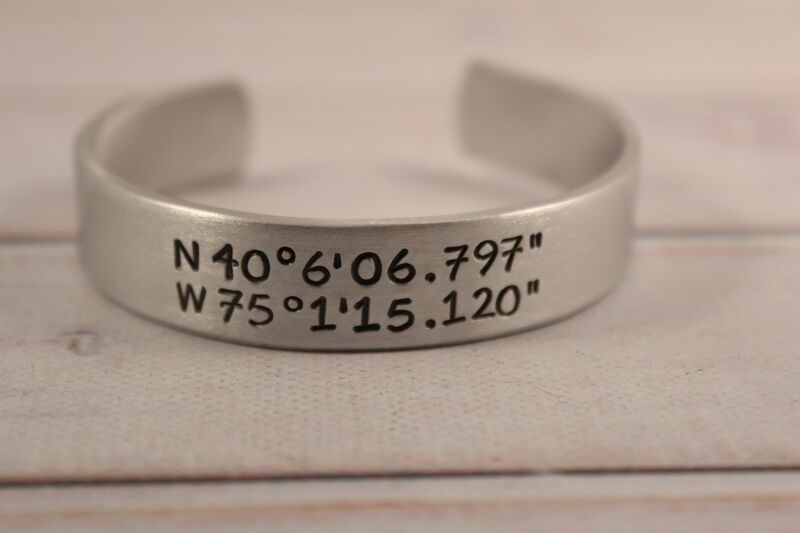 This 1/2 inch aluminum cuff bracelet can be hand stamped with your choice of word(s) or phrase (space permitting)! *Price includes up to 80 characters/spaces on each side. Please note: it is not recommended to have a great deal of text on both sides, as this can weaken the integrity of the metal. *The cuff is created from durable, lightweight, rustproof PURE aluminum, which is tumbled to a smooth finish and is safe on your skin. There is a much lower rate of skin reaction with PURE ALUMINUM than with sterling silver. *Both sides can be stamped. *Some people prefer to have the message stamped on the inside, like a secret message, and that option is available. *One or both sides can be stamped. *Cuff is 6 inches long and should fit MOST wrists. It can be easy adjusted by bending for a comfortable fit. It should fit most women's wrists, up to about 6.5"
*The item will be shipped "gift ready", tucked inside "satin" drawstring pouch. *Not all fonts can be used depending on the length of the text you desire. *Whenever possible, we source our supplies from other small businesses and recycle / reuse packaging materials to help reduce our environmental impact. We recycle all waste/scrap metal. Stamping the letters is a much more durable and permanent method of creation as the text will not wear off like paint or ink and will last for many years. Each design and letter is individually hammered one strike at a time, BY HAND. Because of this, there will be some variations in the spacing, depth of the designs and placement. This is not to be considered a defect but to a part of the character of the piece. Please be aware that the photos shown are simply a representation of previous items I have created and may not be exactly what you receive, as each item is uniquely created just for you. I had made a small mistake as I didn't see the font choices before making the order. I spoke to her about my oversight. We also changed the metal as I swim in a pool on a daily basis. Excellent all around. I had a bunch of questions up front that were answered super fast. I hope to use Trisha again.